Libby was hit by a semi-truck this morning. She seems to be doing well under the circumstances and only has some serious whiplash. Thank goodness it wasn't anything more serious and thank goodness her kids were not in the vehicle at the time! Please say a prayer for her speedy recovery and that no hidden injuries pop up later. I don't know if there is something going on today. Miss M and I were at the Sunnyvale Public Library today. We left the library around noon and while I was getting her back into her car seat I heard a loud noise. I looked toward the direction of the sound but couldn't see what happened until one of the parked cars left. A woman apparently drove her entire car up onto the curb! OMG, people could be standing or walking there! Miss M & I could have been walking there on the way to/from our car. I was relieved to see that nobody was injured. I don't know if she was a bit heavy footed on the gas pedal as she was parking her car or whether her brakes failed. If the car hadn't stopped where it did, it would have hit the parked car on the other side of that corner. I'm starting to think there should be bollards to prevent people from driving up the curb and possibly running people over. 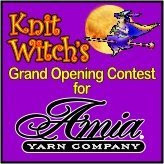 Stephanella is celebrating her first knitting success, a silk lace scarf, by having a contest on her blog, check it out. Lea is having a contest here, all you need to do is leave comments blog posts dated between July 10 and July 26. Here is the beginning of my February Lady Sweater. It's not much. 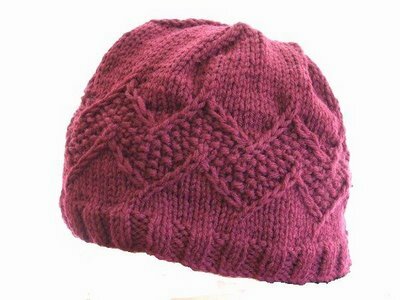 I've worked a few of those raglan increase rows (Row 5) and am not very happy with how mine looks. It feels "holey" to me. 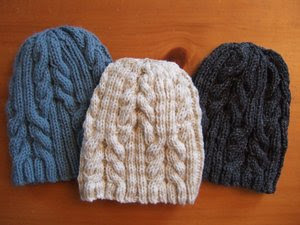 I wonder if I would get better results by using 4.5 mm (US7) needles instead of 5 mm (US8) needles. 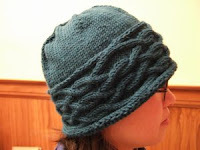 I'm knitting this with Elann Superwash Bamboo yarn. You can't see the buttonhole (left side), but it's approximately where the white stitch marker (right side) is located; I put the stitch marker there as a guide to where to put the button. 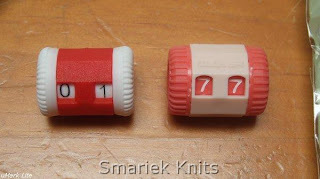 I am using two of my new row counters for this project, one to keep track of how many times I work a Row 5 & Row 6 pair and the other to keep track of which row I'm on. Although I may have to recalculate if it turns out I need to go down a needle size to 4.5 mm and maybe try casting on for the next size up to compensate. 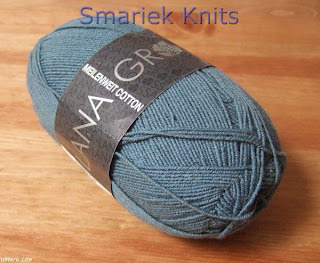 The worsted weight yarn I am knitting with knits mork like DK weight for me. Oh, did I mention I haven't bothered to swatch? Ya I know, bad habit. 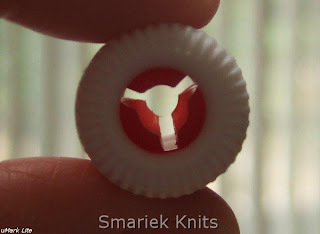 I mentioned in my Wednesday post that I picked up some buttons that might go with my February Lady Sweater. It feels like aeons ago even though that was only 2 days ago. My sense of time is out of whack. I haven't taken these buttons off the card yet. 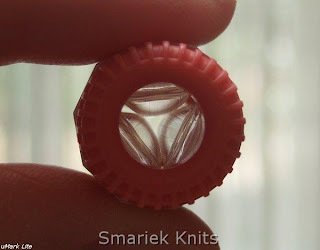 I can already see that my 2-stitch button hole will be too small, so there'll be some frogging to do if I use these buttons. I haven't decided whether this is a good choice. They're purple. 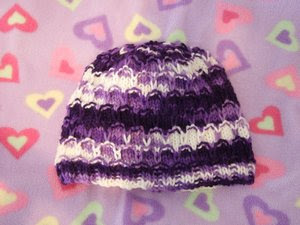 There's not much contrast with the dark purple yarn. Maybe I should have chosen something ivory or wooden. 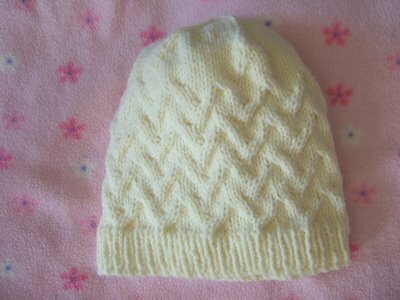 And I'm not sure if the non-smooth edges will play nicely with knitting. Perhaps a smooth round button would be best? I was having some trouble with my last Booking Through Thursday post. No matter how many different ways I tried, I could not get my comment on the BTT site to appear. In fact, I could not leave a comment on any WordPress site even if I was logged into my WordPress account! I felt like I've been blacklisted. It turned out that the problem is the Akismet spam filter. I guess this is a feature that comes with all WordPress sites. Anyhow, while I was slowly working through other people's BTT posts I discovered a book which looked interesting. It's The Meaning of Night by Michael Cox. The BTT post also had a link to the first chapter. I wish I could remember which BTT post it was so I could direct you to it. Anyhow I just got my hands on this and am adding it to my stack although I have no idea when I'll actually get around to reading it. I'm still working through The Lord of the Rings by J.R.R. Tolkien; I am almost finished with the first part, The Fellowship of the Ring. 1. I believe whatever doesn't kill you allows you to live longer. 2. If you're good at something, share that knowledge with someone else. 4. Something is out there, it's an insect or arachnid just waiting to attack me while I'm sleeping (I live in Bugville and I'm phobic). 5. If my life were a sitcom, it would be titled Destination Unknown. 6. Sitting on my back porch [if you don't have one, use your imagination] I see overgrown grass, thriving weeds, an orange tree, a lemon tree, a peach tree, lots of rose bushes. 7. And as for the weekend, tonight I’m looking forward to Friday night pizza, tomorrow my plans include going to the library and doing laundry and Sunday, I want to veg a little (if Miss M allows)! It's interesting how my coffee tastes have changed over the years. I started out with sugar and cream in my coffee. Then for a while I was hooked on mochas. When I finally got around to trying out my Stash Chocolate Hazelnut tea, I was reminded of the time I was in a hazelnut coffee phase where I'd pick up a huge cup every morning on the way to work. Then I tried coffee with no sugar, just cream. Now I've gone back to a little bit of sugar and lots of milk. 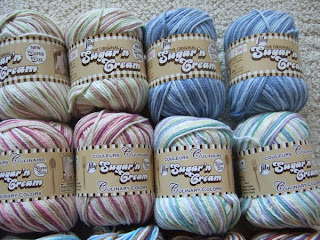 I was surprised during my visit to Jo-Ann when I found a large variety of Sugar & Cream colors. My store usually has only a handful of colors, and usually the same old boring selection. But this time they had a slew of new colors called "Culinary Colors" I had never seen before. So of course I couldn't help myself and threw just a few balls into my shopping basket. I've been on a salad kick lately, I just can't get enough of it. While foods I've liked in the past just don't do it for me now. So I've been eating mostly salads these days. Crumbling blue cheese into my salad is a must these days. I picked up a pound the other day and am being very good about using it sparingly. I could eat this stuff like candy but that wouldn't be a good thing. I haven't been doing much knitting lately. Just chipping away at my MIL's scarf. I'm exhausted all the time and I feel like I need a nap all day long, but don't get to take a nap until sometime after dinner. Then I have to wake up to give Miss M her bath and wind down. After that all I'm good for is watching some TV. I just can't concentrate on knitting. I've been making slow progress on The Fellowship of the Ring, the first part of The Lord of the Rings. This is my first time reading the book. I am nearly done, I've got about 1/8 left to go. It's interesting to see what is similar or different from the movie. I haven't yet decided if I want to jump right into book #2, or to take a break and read one of the many mystery novels I have queued up. Miss M likes reading "Three Blind Mice" by John W. Ivimey. It is a book you can sing with your little one, and it contains many fun variations to this tune. Remember when I mentioned my rodent problem? 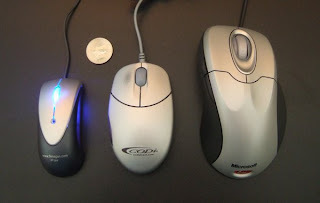 The intermittent mouse is the center mouse pictured above. The quarter was thrown in for size reference. I love the compact size, and it fits my hand (or my hand has gotten accustomed to it). I dug out the Microsoft Explorer mouse (mouse on the right) which drove me nuts due to some annoying quirks. The wheel didn't click and only worked intermittently. Well, I dug around and found the itty bitty mouse you see on the left. I don't know what flavor it is, some generic mini optical mouse. It came from a law firm; www.finnegan.com is printed on the front. They specialize in Intellectual Property. So if you've got an idea you'd like to patent, this is the type of lawyer you'd speak to about it. I'm still getting used to the skinnyness of the mouse. It is way too narrow for my liking, however the wheel works!!! So this mouse is going to do the trick until I find another replacement. Mice, like keyboards, are such a personal thing. So hard to deal with any changes. 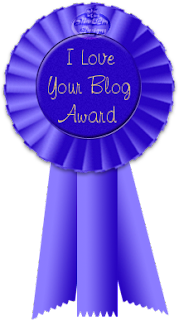 Jennifer is having a 4th Anniversary contest, check it out on her blog here. People have asked about the Banana Nut Bread recipe. I used this recipe with a minor tweak. Instead of 2 cups of bananas, I add about 4 cups. Now I know you're supposed to carefully measure out all ingredients when baking and I do measure everything in this recipe with the exception of the bananas. I usually mash up about 4 medium/large bananas. I don't bother measuring them. But I think it comes out to about 4 cups. 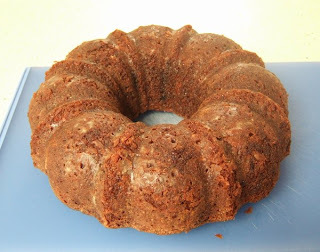 I had tried this recipe as-is and there just wasn't enough banana flavor for my tastes. So I added more banana the next time I made it and it was greatly improved. Oh, I made another batch of these cookies. Miss M really loves helping with the prep work, measuring things out and stirring. Miss M has a habit of asking for "something else" after she finishes her meals. I have no idea where she got the idea that there should always be "something else". Anyhow, on the morning after we baked these and after finishing her breakfast, she asked for "something else". DH asked her what she wanted and she responded with, "how about cookie?" He explained that cookies aren't for breakfast but she could have some later. There is absolutely no knitting going on in my house. I am just having a hard time focusing on anything and it doesn't help that I feel exhausted all the time. I feel like I need a nap in the early afternoon, unfortunately I can't take naps when Miss M has completely shaken off naptime. However I did finish sewing buttons on my mom's vest and I need to post about that when I can find some time to concentrate on typing up that post. As for the February Lady Sweater, I have been thinking about skipping buttons entirely and trying some sort of hook/clasp thing instead. I need to go shopping and see what's available. 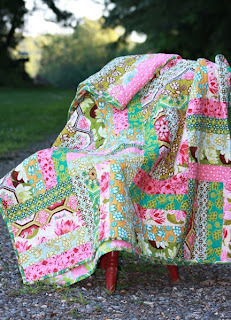 Check out this gorgeous baby blanket. 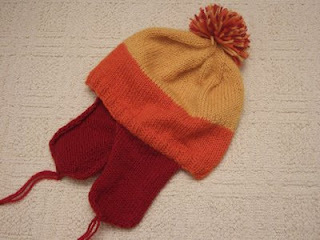 I'd love to make something like that if there wasn't any seaming involved. 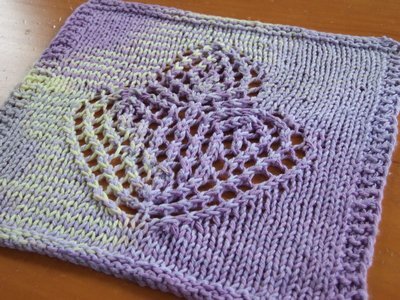 I love Stacey's post about her journey in making the hemlock blanket. This is a gorgeous pattern that I've been thinking about for some time. This Rib Waist Cardigan (1st photo) looks great on the model! 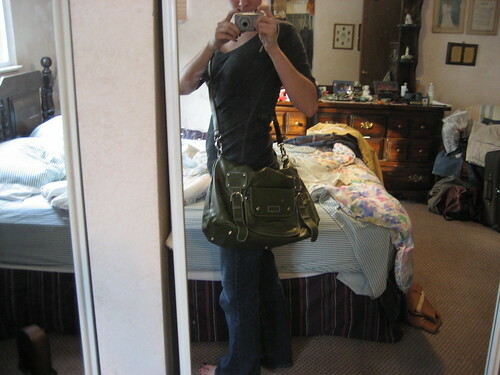 Love the ribbing around the waist. I think this cardigan would look great in purple though (perhaps a little bias here). I also liked the Wrap Vest (the purple one, 2nd photo down on the same page). These patterns are written for sizes M, L, XL, 2X, 3X and 4X. Remember when I posted about Benne's blanket and showed you a photo of the blanket before seaming? Well she received her blanket on Monday, and has finally taken a photos of the finished blanket. You can see the blanket here (click on photos to enlarge). I love love love the square with the crab! That is awesome! 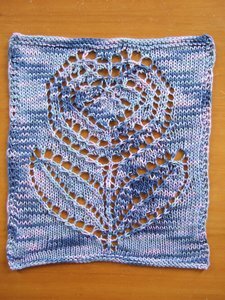 Top row, 1st square is Barbara's dayflower lace; this one was knit right under Benne's nose at Alice Trueman's knitting retreat in Salt Spring Island!!! 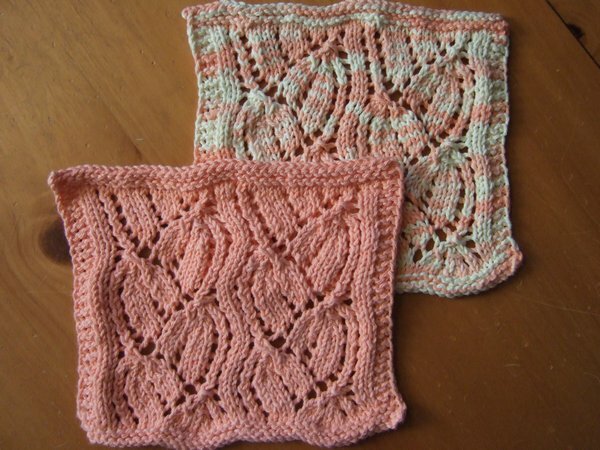 Top row, 2nd square is Kelly's embossed twining vine lace. 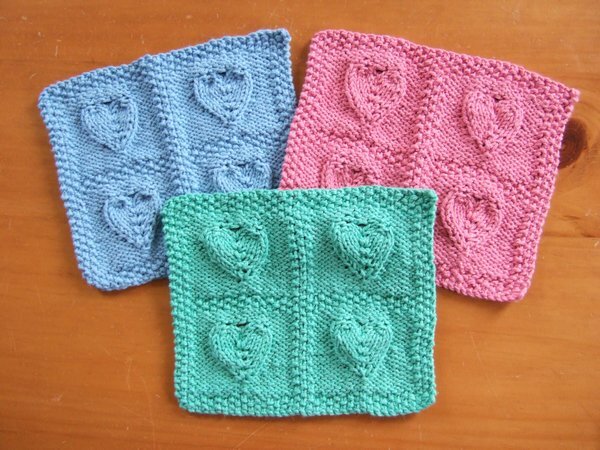 Top row, 4th square is mine based on the Hera Scarf. 2nd row, 1st square is Diane's multicolored square. 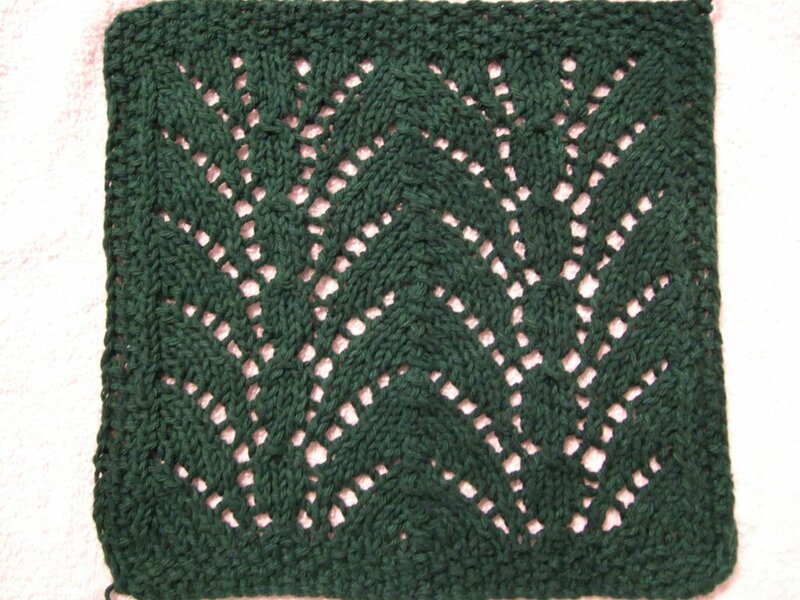 3rd row, 2nd square is Jan's overlapping leaves. 3rd row, 3rd square is Lisa's candle flame lace. 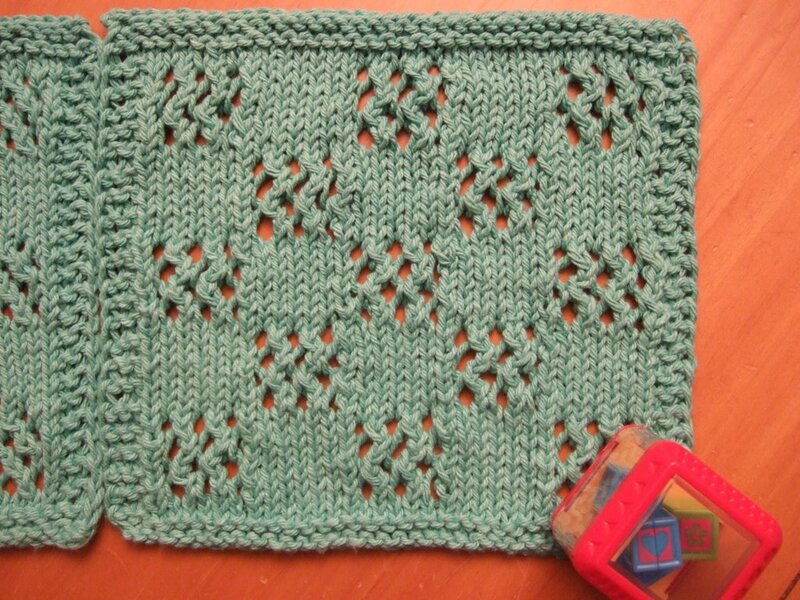 You can see larger photos of her square on her blog here. 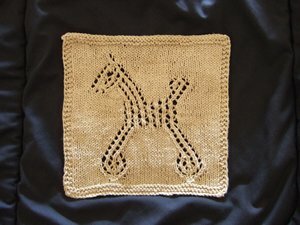 3rd row, 4th square, I think this is Gaile's horseshoe lace. I know she did a green lacy one. 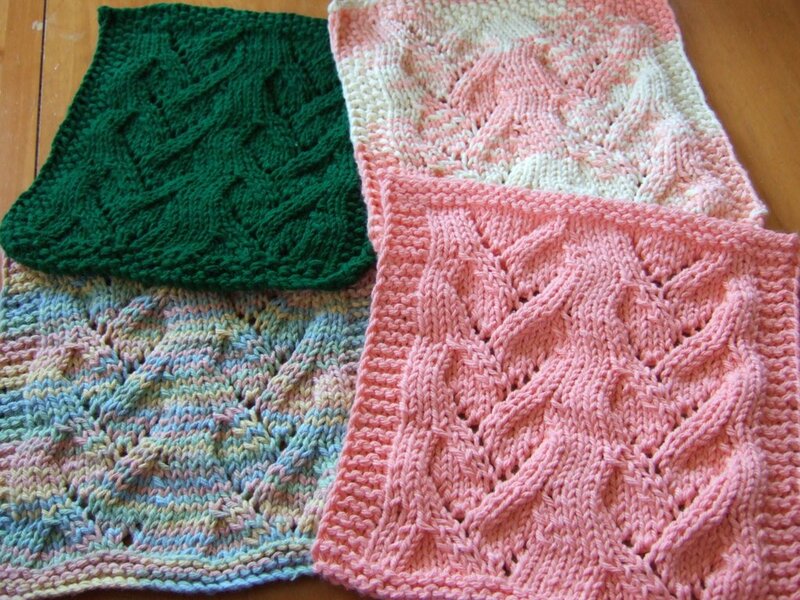 3rd row, 5th square is Jayne's; check out her gorgeous yarn on her Etsy shop. 4th row, 1st square is Ghislaine's hourglass lace. 4th row, 2nd square is Suzann's log cabin. 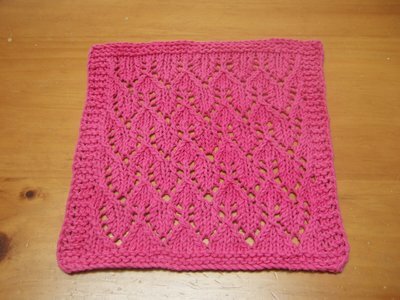 Poor Suzann was very sick during the time we were putting this project together, yet she still managed to knit this beautiful square and then had her daughter finish up by weaving in the ends and mailing it in time. 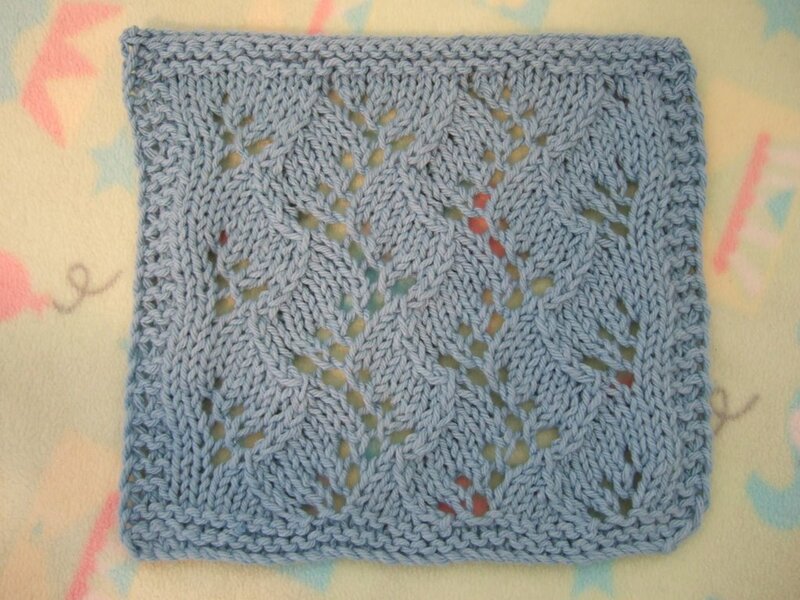 You can see a larger photo of her square on her blog here. 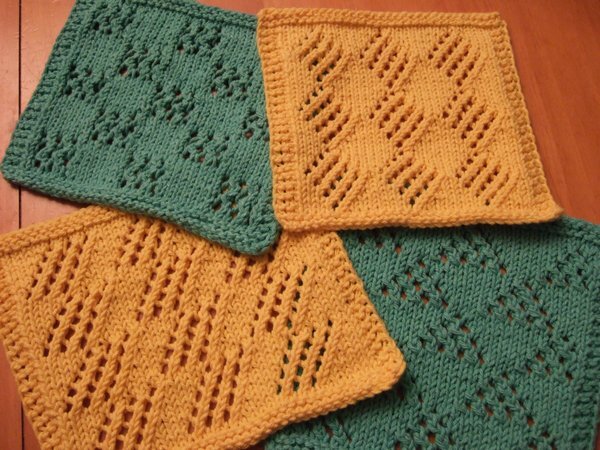 4th row, 3rd square is Trish's cable pattern inspired by the Spring Forward cardigan. 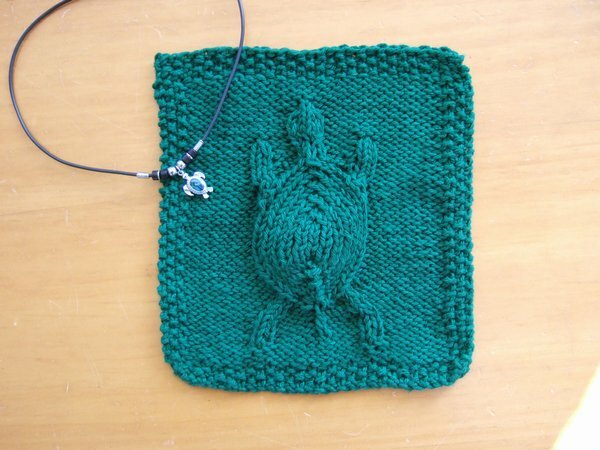 You can see a larger photo of her square on her blog here. 4th row, 4th square is Alice Trueman's. Bottom row, 1st square is Sandra's. 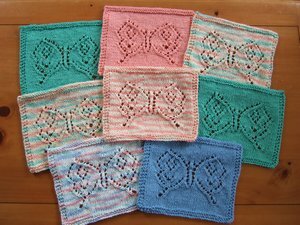 Bottom row, 2nd square is Theresa's square inspired by the Celeste Pinheiro's Tide Pool Blue sweater. Bottom row, 3rd square is Les' square. Bottom row, 5th square is Jamie's. Edging was knit by Bri, Cate, Joan, and Libby. Oh gosh, I hope I get these squares and links correct! Sorry I can't identify each square. Other partners in crime included: Amy, Billie, Cheryl K, Cheryl T, Daryl, Denise, Evelyn, Karin, and Kim. I know that Jean has made a beautiful stained glass hummingbird for Benne. She was taking a class and made this herself! That is so cool! 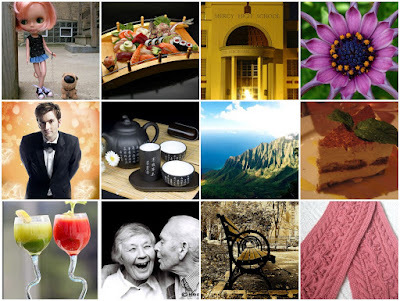 Barbara added photos of Alice's, Jamie's, and her squares to her latest blog post here. Added Diane, Ghislaine, Jan; also link updates. Look what I found outside my front door! A package from Georgi, who recently had a Blogoversery contest. 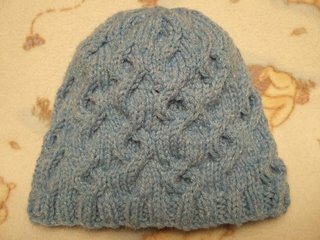 Inside was a ball of Lana Grossa Meilenweit Cotton Sock Yarn in a beautiful blue color. This is a very soft cotton/wool blend. I guess I need to find a nice sock pattern that will go with this yarn. I've never knit socks before, it's been on my "to do" list for some time. I think I'll need to get a set of sock needles first. I've knit fingerless mitts using sock weight yarn (Regina and Persephone mitts) and several circular needles (starting with the 2-circular needles method and then later using 3 to 4 circular needles as if they were DPNs). That worked fine, but the long dangling cords were annoying at times. I was thinking about the Knit Picks Nickel Plated DPN set or the Knit Picks Harmony Wood DPN set, and can't decide which would be the better starter set. I went to Target today to pick up some diapers and noticed their "back to school" section. Is it that time of year already? I will probably be more aware of these things after Miss M goes to school. Anyhow, I love looking at stuff like this even though I don't need any of it right now. I picked up a box of 64 crayons. I remember how great they were when I was a kid. I'm hoping Miss M won't remember me picking those up so that I can give them to her sometime later, preferably when she has figured out how not to break her crayons or rip off the paper wrapping. I picked up a ruler, some kid scissors (hey, she'll eventually need them, right? ), plain index cards (I use these for knitting), and a pencil box. I'm not sure whether the pencil box will be mine or Miss M's. I found myself looking at the zippered pencil cases at the store, they come in so many patterns, colors, and sizes these days! Wanna know what I was thinking they'd be great for? Holding DPNs. Yes, holding the DPNs which I haven't bought yet. I was good though. I put them all back on the rack. Somehow I also came away with a kid lunch box. Note that Miss M isn't in school yet. Lunch boxes have changed since I was a kid. I remember they used to be metal rectangular boxes, with kid designs, and sometimes with an embossed surface. They also came with a thermos inside too. Benne received her blanket yesterday. This was the blanket project I mentioned before, where you saw all the blanket squares before seaming. I can't wait to see photos of the completed blanket. 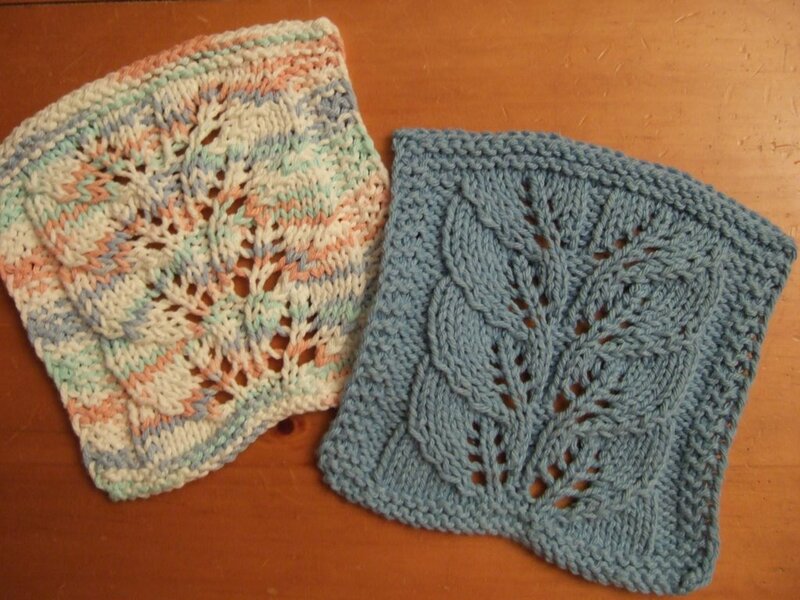 Benne will be putting them on her blog soon, and Bets is still putting together the Blanket Tales. 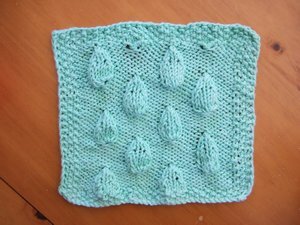 I knit this cloth after Anita emailed me with a question about the pattern informing me that her stitch count didn't add up on one of the rows. So I dug out my notes, compared it to what I had in the pattern page and it looked fine. It had been a long time (a year and a half!) since I last knit this cloth so I needed to refresh my memory. 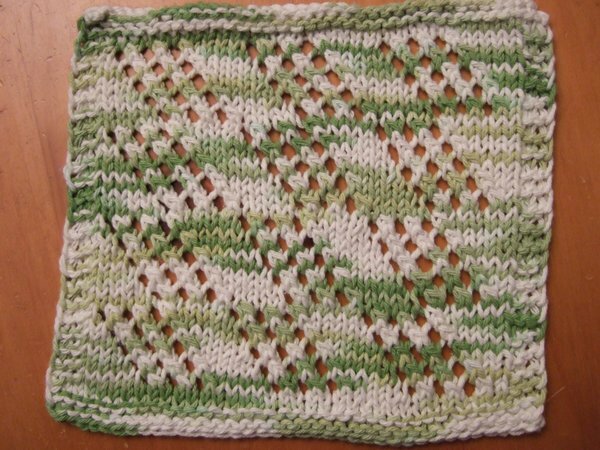 I knitted up this cloth again just to see what was going on. The "fix" for her was to work the D4 decrease in an easier alternative method by doing SSK, K3Tog, and then passing the SSK stitch over the K3Tog stitch. That did the trick and she was able to finish her cloth which you can see here (and here). I think Anita is the only other person (besides myself) to knit this cloth. I remember designing this cloth. 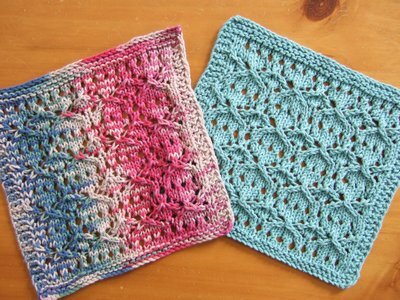 It was one of the more challenging ones for me because I started out with one plain circle (see swatch here) and then had to figure out how I wanted to arrange them on the dishcloth. Knitting them in one column, as in the swatch, was a piece of cake. Arranging them in some sort of configuration that made any sense was difficult. The final design was actually version #2. 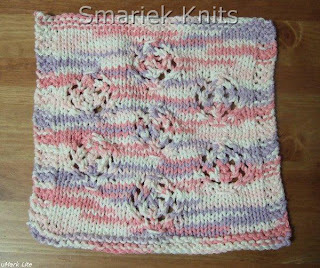 I still use my original tea rose colored Circles Cloth. I make a point of not using it for tea purposes because the tea stains would show up very clearly. I try to put my tea pot and tea mugs on darker cloths where the stains won't be so obvious. It appears that the Dove Family has moved out. I was sweeping in the back yard yesterday morning and noticed nobody was home in the nest. That was odd. There was always someone home during the past few weeks, either Mr. Dove or Mrs. Dove. The only thing I found was a massive poop dumping on the ground underneath the nest. I think they emptied their "trash" and moved out. I haven't seen them today. I'm really bummed about not getting to see Baby Dove. It was much different when the Finch Family lived there (before the Dove Family). After Baby Finch was born, they'd all flit about in the yard and I got to see them all for a while. I'm getting the impression that there is a doctor shortage in my New City (area). It seemed so much easier to make appointments in my Old City. I was trying to make an appt with Dr. H yesterday and discovered she was booked until sometime in September! I needed an appt by mid-August at the latest. The challenge with Dr. H is that she works part time, Wed, Thurs, & Fri. And she'll have to be at the hospital one of those three days, so the window of opportunity for making an appt is really 2 to 2.5 days out of the week. Things were definitely easier in my Old City, where the medical practice consisted of 4 doctors and 1 midwife. You'd get appts with each of them, so you can get to know all of the doctors. Of course, I could try to find another doctor in my New City. When I called to make an appt, the receptionist S rattled off names of some other doctors I might try. I can neve make a decision like that over the phone. I would need to go to our healthcare provider's website to see which doctors are "in network" (which I did, and there weren't that many). She told me she would forward my appt request to the Scheduler who may be able to figure out where to fit me in between now and mid-August, either with Dr. H or some other doctor. I was thrilled when the Scheduler called me back in the afternoon to inform me that she managed to fit me in with Dr. H at the end of July. Yay!!! I'm so relieved. I really do like Dr. H.
I'm off to a slow start on my February Lady Sweater. I just dived right in without swatching. I know this is bad practice. I knitted the first 3 rows, worked the stitch marker row, and then the first increase row (row 5) before getting stuck on the buttonhole row 6. 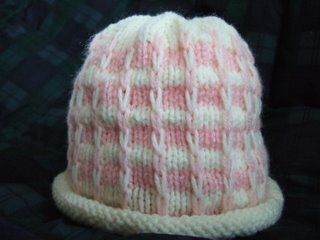 The pattern did not specify how many stitches to bind off for the buttonhole! 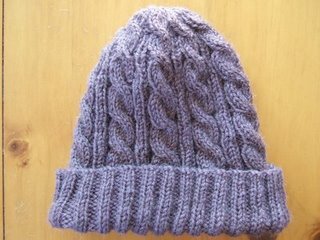 Should I bind off 2 stitches or 3 stitches? 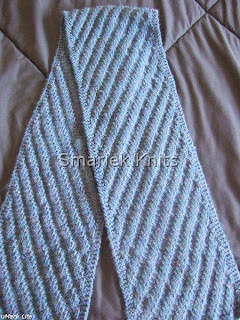 Suzann mentioned that garter stitch stretches. 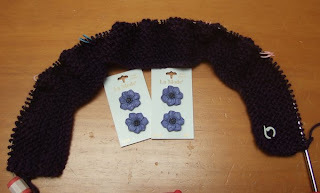 She also suggested that I purchase buttons, then knit up a swatch with the buttonholes and trying it out with my buttons. So until I find some buttons, this project is on hold. 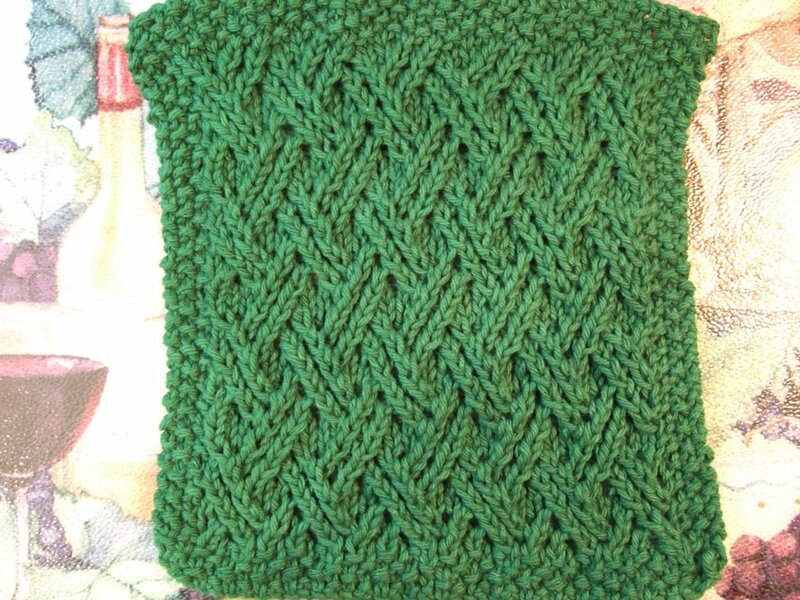 I'm knitting this sweater with Elann Superwash Bamboo. This is my first time working with the yarn. It feels quite soft in my hands, I can see this becoming another favorite. The only issue I have with the yarn is that it is a very slippery on my needles. Why do power outages always happen at night? We had one starting around 8:45 PM which lasted until around 3:10 AM. 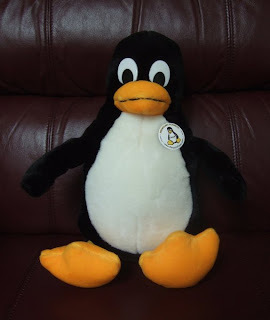 I was lying in bed awake when the power returned, so I saw the night light turn on and heard something go beep. I don't like nighttime power outages. Can't really do much reading, knitting, web surfing, or watching TV. It was a good thing that I had picked up two lanterns a few months ago, a Coleman Family Size Lantern and a Coleman Personal Size Lantern, which I originally bought in case of a big earthquake. So we had some light sources that was better than flashlights. Still, it's not the same as having the use of the floor lamps. Since the power outage was around 6 hrs, I wasn't sure everything in our fridge survived. I had some chicken in the fridge that I planned to cook tonight but threw it out just in case it was bad. We drank the milk, it seemed ok. Haven't yet touched the eggs, butter, yogurt, or cheese. I think everything in the freezer is ok. I was sooooooo glad it was not terribly hot last night. We had a heat wave recently where we had to turn on some fans during the night. That wouldn't have been possible with a power outage. This made me think about how bad it must be to live in a much hotter area (Arizona and Texas popped into mind) and not have air conditioning or electric fans during a power outage. On the upside, there were no new episodes of Naruto last night so I didn't miss anything. I know everyone has already done this aeons ago and it's pretty neato mosquito. I'm pretty slow at this sort of thing, always the last to jump on the bandwagon, so it took me a while to get my act together to put this together. 2. Using only the first page of results, pick one image for each question. Comment here telling me and the rest of our little party where you're at and link to yourself.That's all! * Oh yeah, don't forget to tag others! What's the last book you read that you thought was really super, inspiring, you'd recommend it to most anyone? Hmmm... this is a difficult one since most of my recent reads have been murder mysteries and I can't recommend those unless you're really into that genre. However here are some books I have enjoyed in the past and would re-read again. Alexandre Dumas' The Count of Monte Cristo. Neal Stephenson's Snow Crash and The Diamond Age. Umberto Eco's The Name of the Rose. Albert Camus' The Fall. I'm normally open to trying new foods, and I have no problems eating some foods which many people may find too exotic or unappetizing. I draw the line at insects and the like. Aeons ago when I was having lunch at a restaurant in China (sorry, I can't remember the name of the city), one dish served looked like eggs scrambled with something else. Someone at the table told me that it was the specialty in the area. That something else in the dish turned out to be bees! Um, that was definitely NOT for me. I did not touch that dish at all. I am not interested in consuming insects, arachnids, or anything similar. Did you ever watch a scary movie that frightened you so much you were afraid of the dark afterward? I mean like you're lying in bed trying to sleep, but you have to pee, but you're scared to get up. It doesn't have to be recently; could be when you were a kid. So what movie was it? I'm not really into horror movies. Is there a song that makes you dance every time you hear it? Would you tap you feet and sing along to it in public? Tattoos: yes or no? Do you have any? Tell us! Do you think they're gross? TELL US! When's the last time you laughed so hard your ribs ached and/or you nearly peed yourself? What made you do it? Draw or doodle a picture of your pet(s) and post it if possible. Nothing fancy, don't be shy! Oh gosh, I couldn't draw a straight line to save my life. But I guess I'm off the hook since I don't have any pets right now. Go through a stack or box of your old music. Stuff that you may not have heard in years. Pick one and tell us about it. Is it as good (or as bad) as you remember? Most of my music is packed away in boxes. We've converted most of the CDs to MP3. Most of the records have been thrown out, but I do have a box of 7" singles containing mostly 80s music. I've been meaning to throw this box out. I don't even have a record player anymore so there really isn't much point to keeping them. Anyhow I pulled out this single from the box. 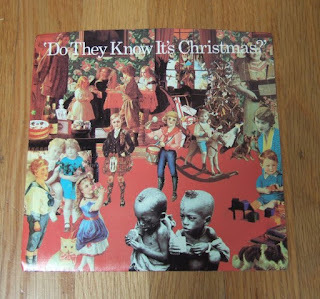 It's "Do They Know It's Christmas?" and when I turned it over, I saw it dated 1984. Oh my, has it been that long? I still like this song even if it's not very popular these days. I don't even think they play it much on the radio during Christmastime. I kinda miss all the cool artwork on the covers of vinyl records, particularly the 12" ones. Do you still sleep with a stuffed animal? We won't laugh! Nope, but I still have a bunch of my stuffed animals in a box. Some went to Miss M. She's not getting Tux though; he's mine. You've already seen this before. Now I can tell you a little more about the secret project. It was one month ago when Benne discovered she needed eye surgery and from this a group project was born. Libby was the ring leader; she's had prior experience with organizing a blanket project when we did Cheryl's Blanket Square back in October 2007 (see here and my square here). 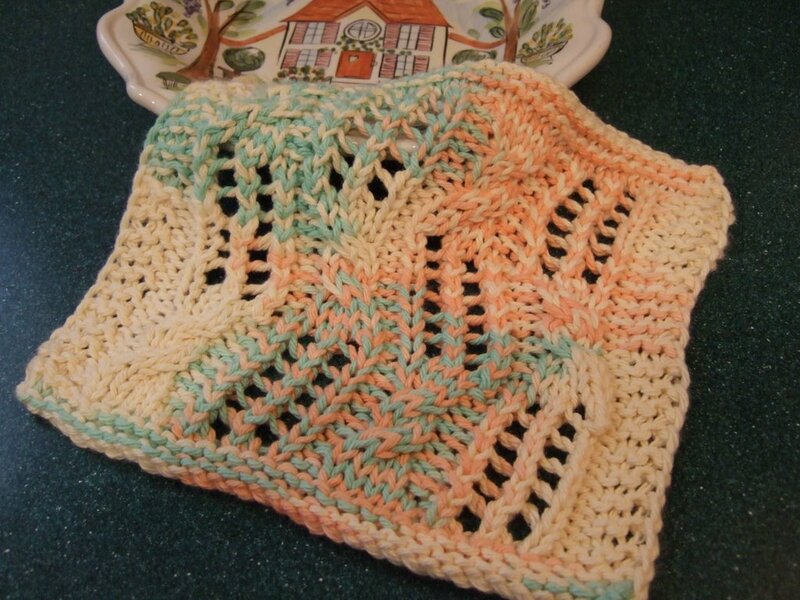 We had several months to complete Cheryl's blanket, about 4 to 5 months. Benne's blanket on the other hand was put together in one month. One month! A project born in the beginning of June with the goal of completion by July 8, 2008. We needed to get our squares to Libby by June 29, so she would have time to sew it all together. With over two dozen people involved in this blanket project, this certainly must be a quintessential example of group synergism. 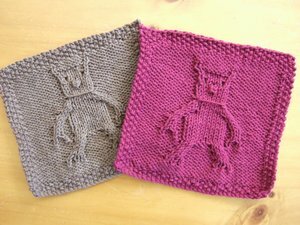 Due to the aggressive time line for Benne's blanket, I was fortunate to have the Hera Scarf pattern ready to go. I was glad not to have to spend time trying to figure out what to do for my square. 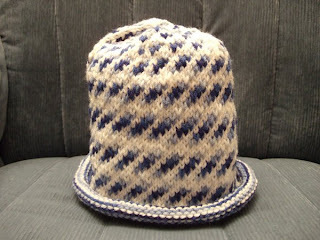 I started the square on June 8, would have finished on June 9 if Miss M wasn't sick, and managed to finish on June 10. Being the lazy the person that I am, I didn't get around to weaving in the ends until June 13. I actually goofed in this square. 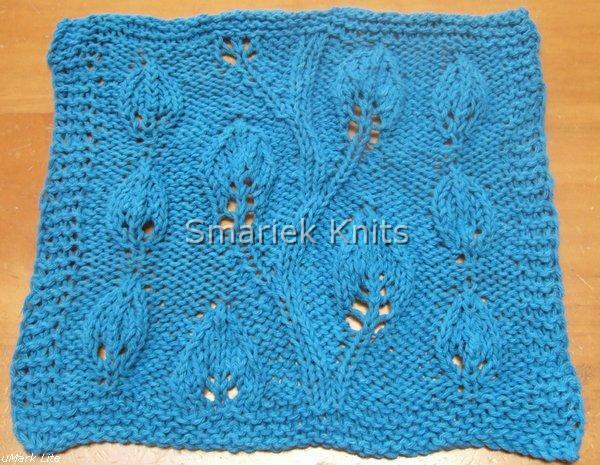 I knit an extra row at the end before knitting the top border. I don't think anyone will really notice, but it sure does bug me!!! 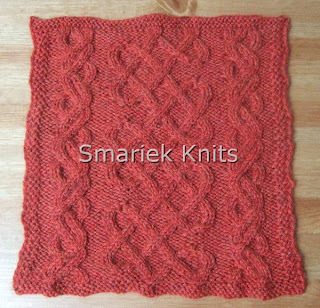 This little red square is knit with Elann Highland Wool in the beautiful Red Maple color which I had also used in my Luna Moth Shawl. I just love this color. You have to see it in person to truly appreciate its beauty. 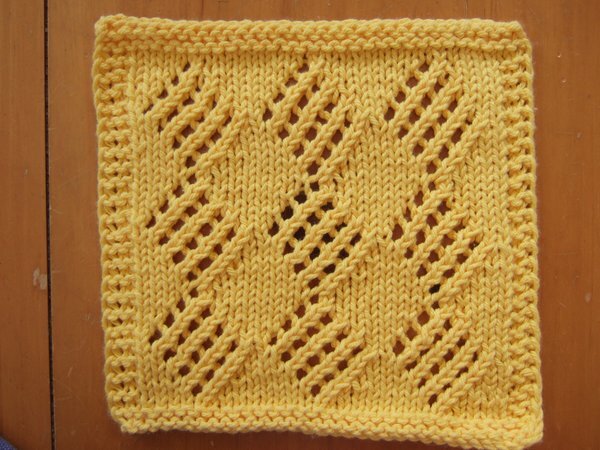 I normally use 4.5 mm (US7) needles with Highland Wool, however for this blanket square I went down to 4.0 (US6) partly because I was afraid of exceeding the 12" square size limit. Do you know how hard it is to try to get a specific finished size? It's no wonder I prefer "free form" knitting, lol. 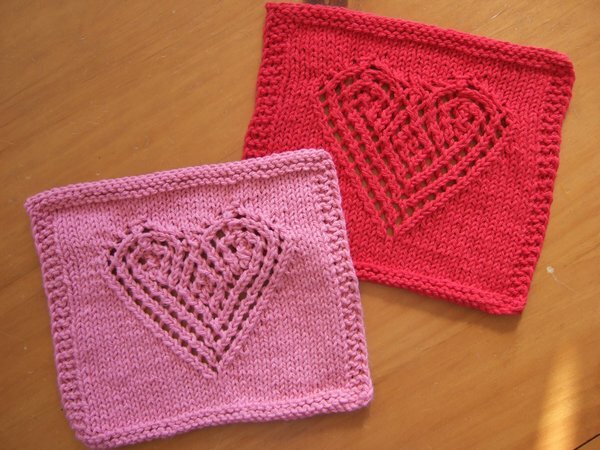 Although I must admit that it seemed easier this time around than when I made Cheryl's blanket square. Only a smidgen of the 2nd ball was used for the last 8 or 9 rows. 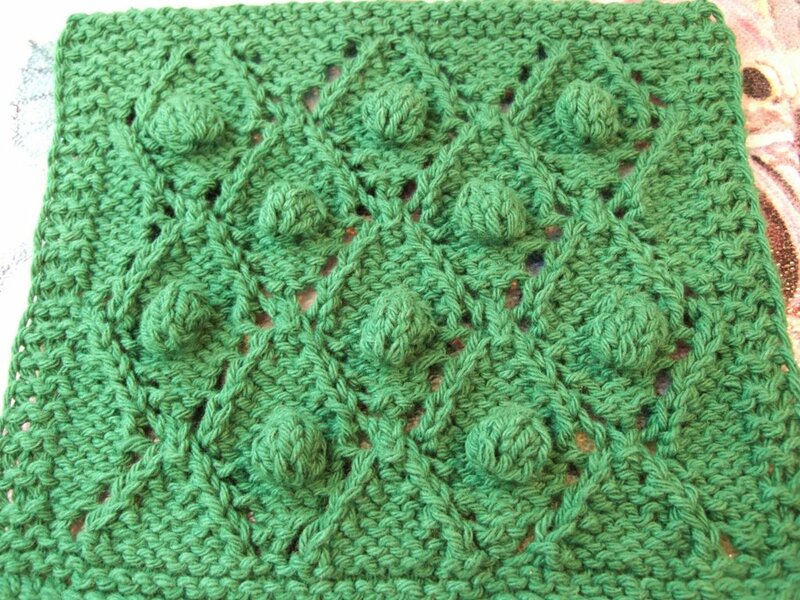 I think one ball would have been sufficient if I had chosen a plain knit/purl pattern or a lacy pattern. 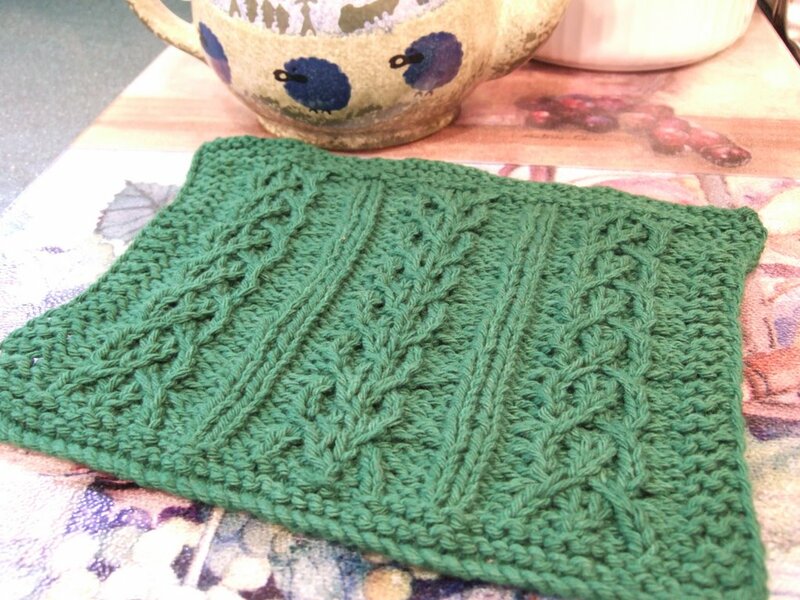 We received this photo from Libby, it shows what the blanket looks like before seaming. 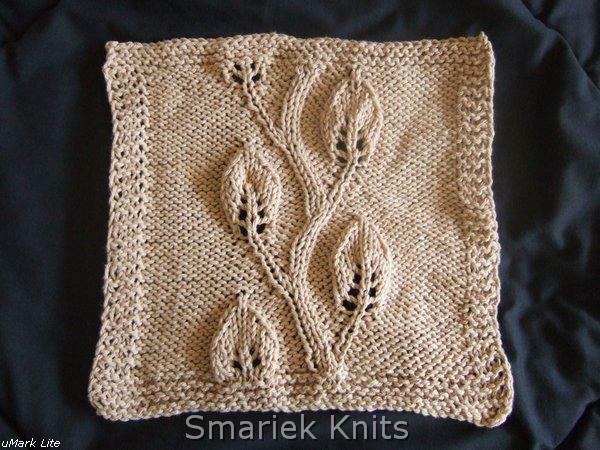 There is a lacy border that will go around it too. I'm looking forward to seeing the finished blanket. Hot hot hot. It's way too hot here. I can't believe the thermostat was already 73ºF inside the house at 7 AM. We are definitely going up into the 90s today. 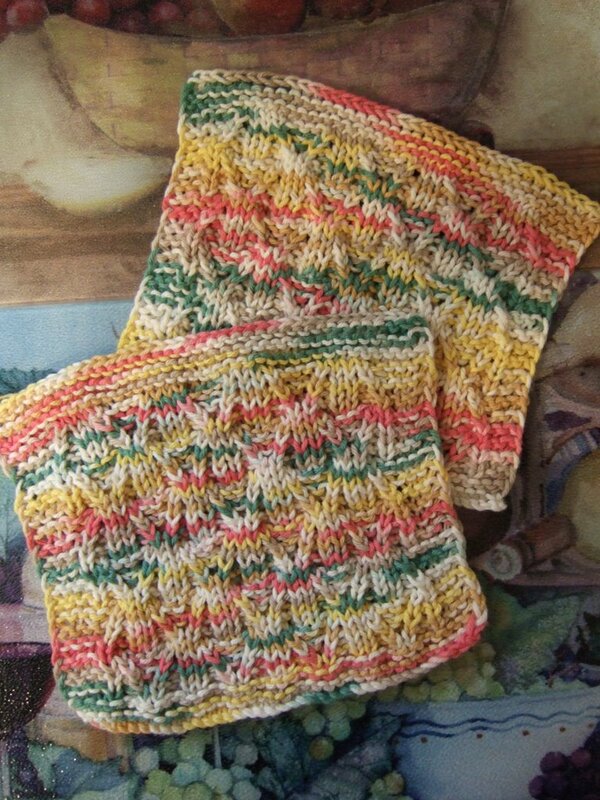 I haven't been knitting much lately due to the warm weather. 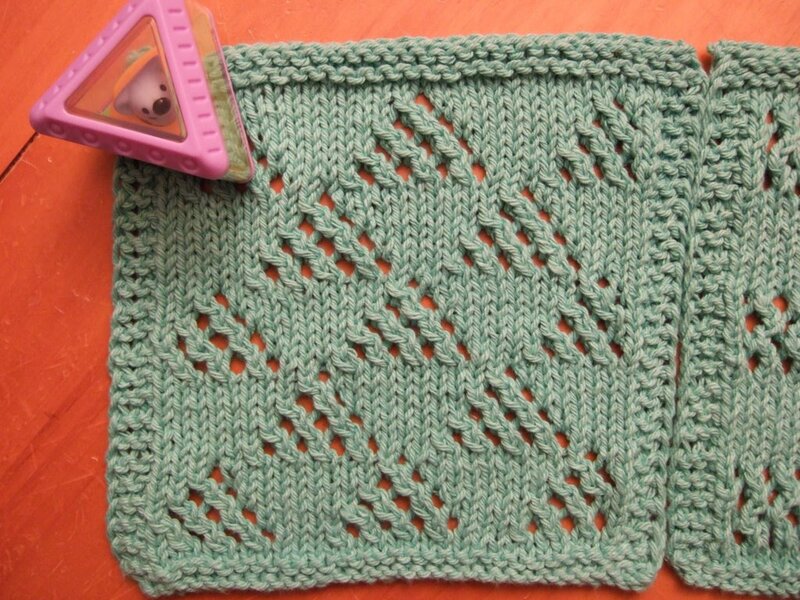 As I'm cruising around the knitting blogs and other places, I've noticed a distinct trend of people knitting (or thinking about knitting) the February Lady Sweater. What is this sweater that everyone is talking about? I had to find out more. I looked it up on Ravelry and it is a really cute sweater. Hmmm, I wonder if it's easy enough for me to knit? 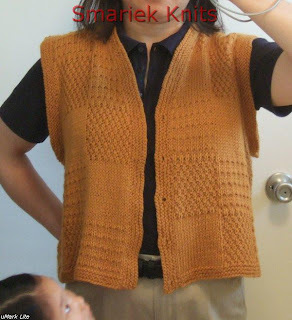 One of the photos on the main pattern page shows a pregnant woman modeling the sweater, so that gives me an idea of how it would look over a big belly. I need to take a closer look at the pattern to see whether the pattern is doable for me. I already have a few yarn possibilities in mind. 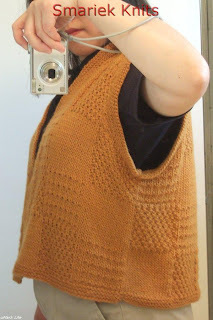 Kimberli pointed out the Assemblage sweater (Ravelry link) which she has been wanting to knit. 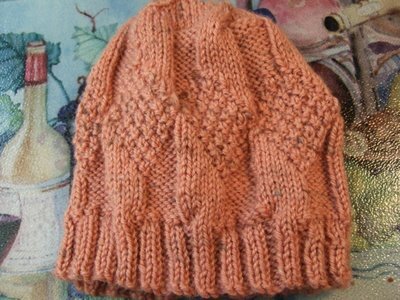 It is somewhat similar to the February Lady Sweater in that it only buttons at the top and is open at the bottom. 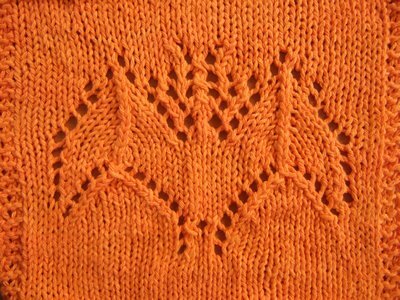 The Assemblage sweater has a more solid fabric (non-lacy) and longer sleeves. My first thought when I saw the Assemblage sweater is the fold over collar which would hide any botched up shoulder seaming. Yeah, I still have to learn how to seam properly. 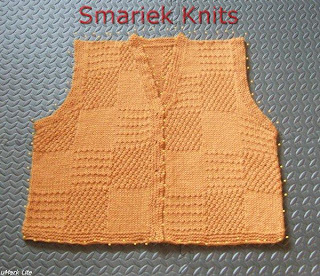 What I did on my mom's vest isn't pretty to look at; it would have looked worse if her vest was plain stockinette on both sides. I think the easiest cover up would be to knit a shawl instead of a sweater. 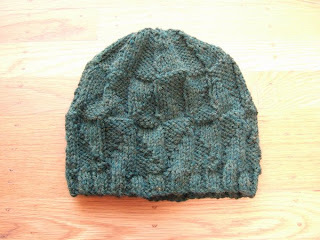 Or maybe even something like the Lake of the Woods (Ravelry link), a wrap which would stay on easily, which I saw on Kim's blog. I didn't see any photos of anyone using this as a maternity wrap, but I can imagine it working out. 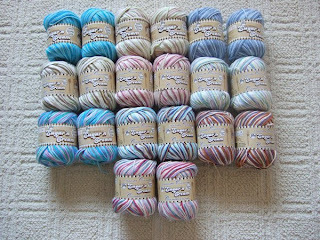 So my friend mentioned that she is going to join in the Ravelympics knitalong. She's not a member of Ravelry though. Like me, she is using the Ravelympics as a good excuse to start and FINISH a knitting project within a specified time range. She told me she was thinking about making My So Called Scarf (Ravelry link), and asked me what yarn she should use. She wanted to make it in red. 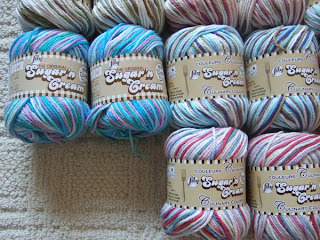 I immediately thought of variegated yarn, but didn't have anything specific in mind. 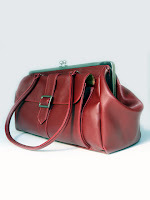 Then thought, how about Malibrigo merino wool in the Amoroso or Vermillion colorway? Mmmm, luscious merino! Speaking of the Ravelympics, I had joined the Scarf Stroke and Cable Steeplechase events. Some new events have been added (see list here) since then, so I have also joined the WIPs Wrestling and Gift Knits Pentathlon events. 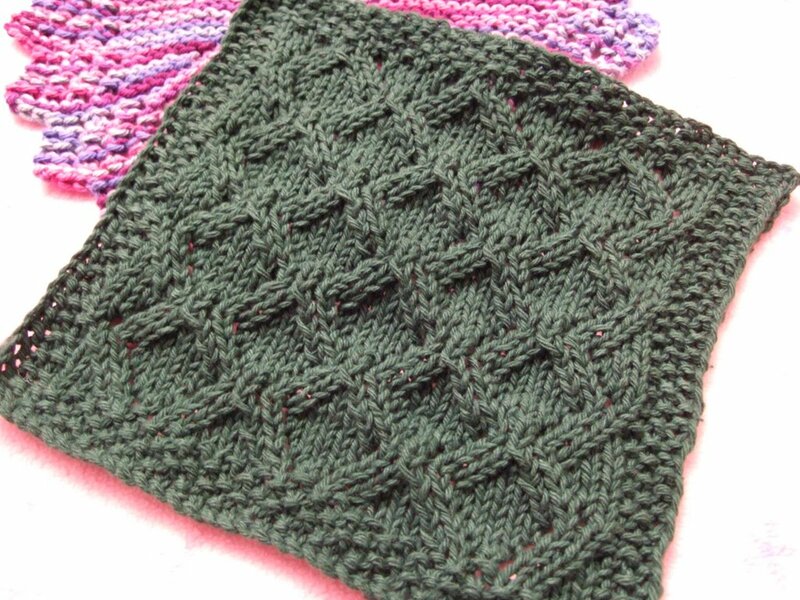 I'm going to cast on for the Triumph Cable Scarf for the Scarf Stroke and Cable Steeplechase, and try to finish off Regina for WIPs Wrestling. 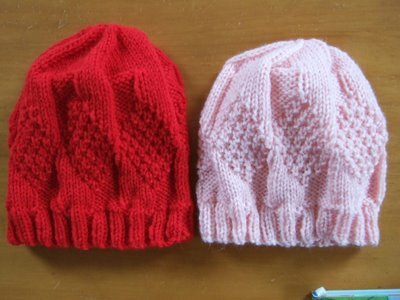 Both of these fall under the Gift Knits Pentathlon. I wonder if I am overextending myself here. Can I finish both in the 17 day window? I'm almost done with my mom's vest, will post about it soon! Ok, I've gotta post this now. The guv is bored watching me type this up on the computer. We need to go run some errands before it gets too hot outside. This is a followup to my original post about the Ravelympics and the swatch I made for it. Last night I created the chart for the Triumph Scarf swatch you saw yesterday. It's rather amusing how this came about. 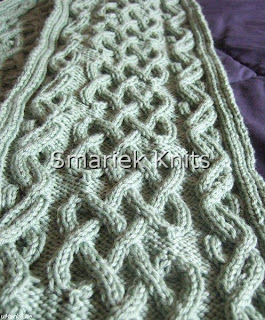 It all started on Friday when I translated that center-cable chart into row-by-row instructions while adding in the extra cables/stitches on either side of it. I got all of this onto 2 sheets of paper, then transcribed them onto index cards (which I knit from). Then I translated what I had on my index cards into an Excel chart. 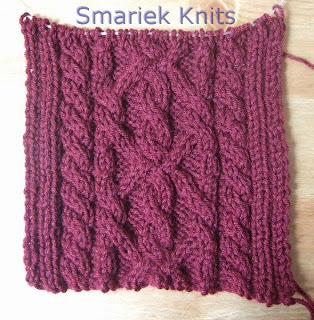 I must say that as time consuming as this was, it was way easier than doing the chart for my Hera Scarf (btw, I still need to get off my lazy behind and type up the row-by-row for that one). I uploaded the chart to Box.net this morning, so y'all can take a lookie if interested. I think the only reason I managed to get all of this together so quickly is because Miss M spent the night with her grandparents. It was a nice little change for us, DH & I, to go out to dinner. Nothing fancy, just The Fish Market Restaurant. I've never been disappointed with the fish there. I had sea bass, he had sablefish. It's actually a kid friendly restaurant. I've taken Miss M there for lunch and she loves it. I think having the basil tomato side dish and the flourless chocolate cake has something to do with it. It was a nice change to actually get to eat the tomatoes last night; Miss M usually eats them all. Ok, I'm feeling good about this. I have my pattern. 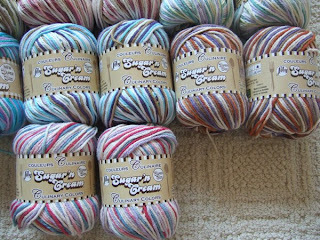 I have my yarn. 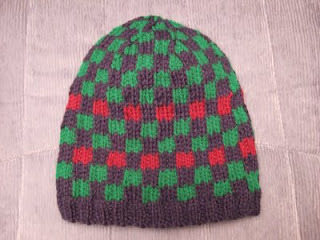 I even set aside needles for this. I'm just waiting for August 8 to begin knitting. Hopefully I'll be able to finish by August 24 and have some photos to share with you. 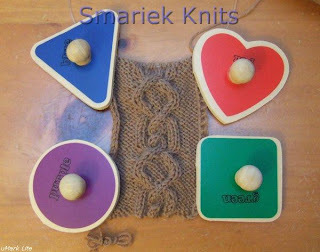 I think the Ravelympics is a fun way to motivate me to start and FINISH a knitting project. 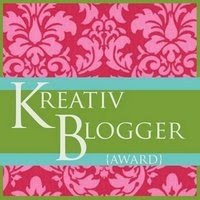 Yesterday, I found out about the Knitting Olympic Trials from Kimberli, who is organizing the event in the Ravelympics Group (formerly named Knitting Olympics Ravelry Group). The idea is to start a knitting project during the opening ceremonies (August 8) and finish it by the time the Olympic flame goes out (August 24). Doesn't that sound like a fun challenge? And the best part is that you'll (hopefully) have a finished project by the time it ends! There are many events and teams. I haven't had time to look through all of them. The first event that jumped out at me was the Mitten Medley. Then I later saw the Scarf Stroke, which is more suited to my comfort level. 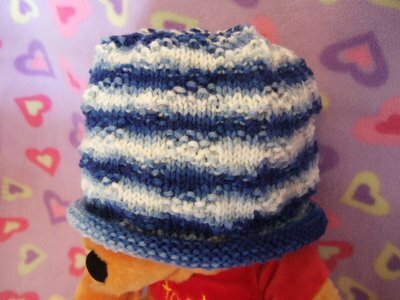 I know the Ravelry group can seem overwhelming when you first look at it (I sure thought so! ), but it's really supposed to be low stress and fun. Just choose any project you want to start and finish during the time frame. Your project will probably fall into one of the event categories. Joining a team is optional. This morning while Miss M was occupied I managed to sit down and think about what to make. At first I thought I'd try lace, then nixed it. 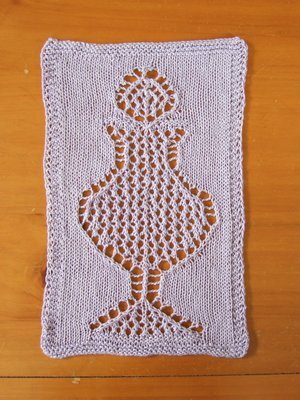 There's no way I could concentrate on lace. 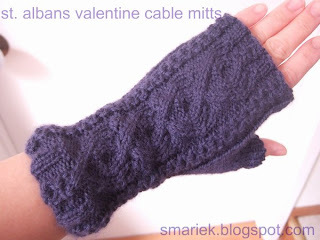 So I fell back to cables, something I can usually knit while watching TV. I've scribbled down my pattern and haven't had a chance to swatch it. I'm not even sure I'll do that since I have so many other knitting projects I need to clear off my plate (*cough*HUGe swap*cough*) before I can comfortably begin. I also need to figure out what yarn to use. 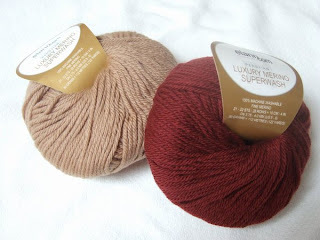 Right now I'm think of using the light brown ball you see above, Elann Luxury Superwash Merino. This would be a refreshing color change for me. 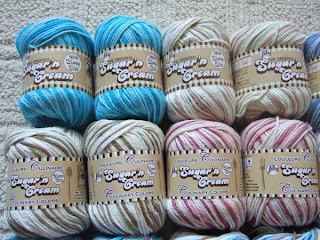 And the yarn is such a pleasure to work with, it feels so soft in my hands.